Preheat oven to 400 degree F. In a large bowl, combine melted butter, sugar and egg white. Add flour and mix very well. Butter should be smooth and should flow easily. Grease baking sheets with shortening. Drop batter by teaspoons on baking sheet. Make sure to leave ample spaces between the circles of batter. (for a start, bake only one fortune cookie at a time until you get used to the quick steps needed after removing the cookie from the oven. Using a spoon or an angled spatula, spread the batter rounds thinly on the baking sheets, so that they become almost transparent. Each round should be at least 3 inches in diameter. Place cookie sheet in oven and bake for 4 minutes; cookies will have brown edges. Remove sheet from the oven at once and scrape off each cookie with a spatula. 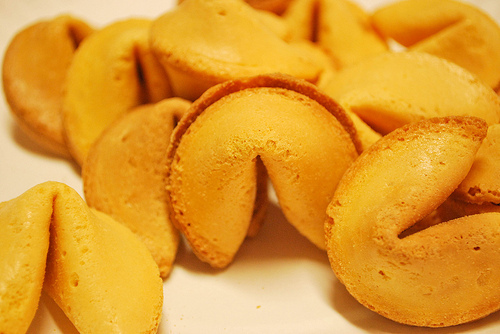 Immediately place fortune message in the middle of the cookie round, then fold and seal the cookie. You have to work very fast while the cookie is still very hot and flexible; otherwise, the cookie will break when you attempt to fold it. While the folded cookie is still soft, place it horizontally on the edge of a drinking glass and bend it carefully using your fingers or a pair of flat tongs. Once the cookies have hardened, put them back on the cookie sheet. Bake them again at 400 degree F for 3 to 4 minutes or until goldedn brown. Let cool. You may wrap each cookie in foil or cellophane. End.